I had family in Las Vegas this week, so when I read that one man -- just one -- killed 58 people and injured another 515 at a country music festival on the Las Vegas Strip, I naturally called to make sure they were alright. They were, because they’re not into country music, which might have been why the concert was targeted. My aunt said despite being just “next door” at the Luxor (half a mile away), they couldn’t hear gunfire coming from the 32nd-floor window at Mandalay Bay, where 64-year-old Stephen Paddock fired upon thousands of innocent concert-goers. While ISIS has claimed responsibility for the attack, of course they have. It’s the deadliest mass shooting in United States’ history, which is exactly the kind of press ISIS seeks. But despite FBI Las Vegas Special Agent in Charge Aaron Rouse saying they’ve found no connection between the shooting and an international terrorist organization, it would make more sense if they do find a connection with ISIS. If Paddock was indeed acting as an agent of ISIS, an outdoor, country music concert in Las Vegas is a prime target for an ISIS attack. It certainly makes more sense than an Eagles of Death Metal concert in France. First, it’s Sin City, so regardless of who the terrorist shoots, in his mind, she’s a sinner -- guilty by association. Secondly, the country music fan is almost certainly an American infidel, which couldn’t be said about any other genre. A thoughtful editorial by CNN’s Fareed Zakaria opines that radical Islam is the product of "broken politics and stagnant economics of Muslim countries," so while the Quran endorses violence, it specifies a very vague enemy. Even Muslims trying to make it in America are targets of terrorism because they’re accepting the vulgarities of the modern world that’s left the Muslim world behind. Regardless of whom a follower of Allah determines to be an enemy of Islam, they should not be able to injure over 500 people and kill more than 50 in a matter of minutes without strapping a bomb to their chest. Had the gunman been forced to shoot people with a single shot rifle or pistol, he would have been killed by police before he could reload. Automatic weapons with detachable magazines serve no purpose but to wage war; recreational entertainment is not a purpose. Our entertainment is not reason enough to continue to allow more people to die en masse from gun violence than any other country in the world. I like firing automatic weapons, but I don’t need to fire automatic weapons, and neither do you. Been to America's Roller Coast? That's where my daughter, Alexis, and hubby, Carmine, took a road trip this week. They check in LIVE from Cedar Point in Sandusky, Ohio on this week's show. It’s the only amusement park in the world with five roller coasters taller than 200 feet! These two thrill seeking newlyweds just got off one. As a neurotic mother, I’m thinking, "Couldn’t they just fool around at ground level at home?" Who knew that Cedar Point is the most visited seasonal amusement park in the United States. An estimated 3.6 million visitors went in 2016. I would have posted the video Carmine sent me of them in real time riding one of those major roller coasters but there's some adult language at the beginning, so I couldn't . There are 17 roller coasters at Cedar Point but four are action park favorites – Maverick, Millennium Force, Valravn and Top Thrill Dragster. Carmine and Alexis check in with Top Thrills from Cedar Point at the top of the show today. Very funny. Speaking of funny – I had a big, fun, hilarious, random run-in this past week! Who didn't love Cindy Williams as "Shirley Feeney" in Laverne & Shirley? Or as 'Laurie Henderson' in the film American Graffiti? Cindy's latest riot of a role has her on stage in Las Vegas in Menopause The Musical, and she's on the show this week along with producer Kathi Glist of GFour Productions. Cindy's still HOT (like the rest of the cast). Thanks to my Aunt Linda (upper row on left facing you), I met Glist (in between Aunt Linda and me), and we're posing behind Cindy Williams (bottom row center) and two of the four super-talented cast members who had me crying with laughter and in awe of their talent. 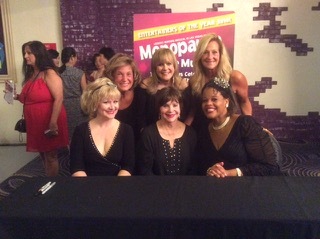 To the credit of Kathi Glist and GFour Productions, Menopause The Musical is "The Longest Running Scripted Musical In Las Vegas History." Now playing at Harrah's 350-seat Improv Showroom, eight shows per week, 52 weeks per year. The show has also played to 11 million audience members in 13 countries, 350+ cities and has been translated into five languages, and it just keeps going. HOT is worldwide! Fun to see how many men truly loved this show, too. The hilarious musical parody is staged to classic tunes from the '60s, '70s and '80s. Set in a department store, four women with seemingly nothing in common but a black lace bra on sale, come to find they have more to share than they ever imagined. The cast makes fun of their woeful hot flashes, forgetfulness, mood swings, wrinkles, night sweats and chocolate binges. A sisterhood is created between these diverse women as they realize that menopause is no longer "The Silent Passage," but a stage in every woman’s life that is perfectly normal. GFour Productions also launched the Survivor Tour to benefit the Susan G. Komen Foundation. The musical has raised more than $1 million for charitable partners. It's a must-see if you're in Las Vegas, or check here to see when the show will be in your town. You can tune into “The Debbie Nigro Show” at GCNLive.com on Saturdays at 2 p.m. CST by visiting here. My dad has been visiting Sin City for years, and always seems to leave Las Vegas with cash. Many times his entire trip is paid for thanks to thoughtful gambling practices like knowing when to cash out and knowing when to raise the bet. Instincts aren’t teachable, though, so here’s a foolproof way to leave Las Vegas with cash. Budgeting for Las Vegas is the most important thing you can do before you leave for Las Vegas. Right around the time you book a flight to Sin City, and that should be at least two weeks in advance (and departing on a Sunday and returning on a Tuesday), start putting some money aside specifically for entertainment, which includes gambling, shows, activities and escorts. While prostitution is not legal in Clark (Las Vegas), Washoe (Reno/Tahoe), Douglas and Lincoln counties, there are brothels in the rural areas of Nevada where you can pay for a legal, good time. GCN Live does not condone these activities. I’m just giving you the facts. I started an automatic transfer from my checking account to my savings account and withdrew the accrued amount in my savings before boarding my flight to Sin City. That way when I arrived in Las Vegas, I knew exactly how much cash I was willing to lose. This is the key. Once you’re comfortable losing that money, you’ll always come back a winner as long as you don’t allow yourself to lose more. That money doesn’t belong to you anymore. It belongs to Las Vegas. This mindset also improves your chances of winning money, because the best way to win is to act like you’re playing with someone else’s money -- as long as you play the games you can control. This is the toughest part for people visiting Las Vegas. The bright lights of the slot machines stretching to the ceiling and featuring their favorite celebrities (Cher, Britney Spears, etc.) or television shows (The Walking Dead, Big Bang Theory, etc.) can be overwhelming. Don’t give into your urges, but if you must play the reel games or keno, play on the outskirts of the Vegas Strip. The slots are looser the farther from the strip you get because it’s harder for casinos farther from the strip to entice customers to make the trip. The slots at Fremont Street and the South Point Casino are said to be loosest according to locals, with South Point’s tagline being, “The point of more return.” If the slots are your bag, play where the locals play. Otherwise, play the games you know you can control, which means play the games you know something about. My dad plays blackjack because he feels it’s a game he can control, especially if you place yourself properly at the table and are strong in math (not to count cards but to get a sense of what the odds are that you get a card you need). I stick to Major League Baseball betting because it’s the sport about which I know most. I play fantasy baseball every year, so I’m already doing a bit of research everyday. I’m pretty good at picking pitchers who will toss quality starts, and you can even place bets on the first five innings of a game. Placing just a couple of bets a day, including a parlay that pays, I not only limit the amount of money I can lose, but I’m entertained the entire day by games I wouldn’t normally watch. I’ve also been known to play No Limit Hold ‘Em poker, both cash games and tournaments, because it’s “the only pure game left.” You can outplay your opponents in Hold ‘Em by simply observing their mannerisms and remembering the patterns of their play. It’s a beautiful game, and you can generally find a freeroll tournament in any casino that will help you learn the game at no cost to you. Leaving your credit cards at home ensures you won’t attempt to make back your losses by taking an expensive cash advance out on your credit card. Credit card companies love people with gambling problems because they get to charge a fee between two and five percent for you to withdraw the cash and then charge a daily interest rate between one and seven percent higher than your interest rate for purchases. The easiest way to avoid this is to leave the plastic at home, and it will also force you to stick to the cash budget you set in step one. Reading the local newspapers and free publications is the best way to get to know any place you’re visiting. Buffets, drinks and entertainment in Las Vegas aren’t as cheap as they once were, but coupon books and local publications like The Sunday and even the Las Vegas Sun newspaper can steer you in the right direction for cheap eats, drinks and entertainment. Most hotels will issue visitors a coupon book in an attempt to keep them in their casinos and restaurants, because the longer you stay within their walls, the more likely they are to get your money. The coupon books usually provide a few free drinks and cheap buffets, discounts on show tickets and other entertainment, and even free casino play for joining their members club. Do yourself a favor and join all the clubs. You might not win on the casino’s dime, but you’ll be entertained for free and your cash budget will be affected that much less. Travel blogs can also be helpful in finding bargains in Sin City. The best deals on food and drink are also off the strip, but you can find even better deals by using the Groupon app. Imagine getting $30-worth of food for $12. That’s what Groupon can do for you. It can get you a spa day for half price, too. There are also discounts on VIP Vegas club entrance, limo rides, painting and singing lessons, buffets, etc. You can also save money using Expedia to find discounted activity tickets if you purchase in advance. Tickets to The Mob Museum are about $24 at the door, but just $19 if you purchase through Expedia a day in advance. It’s a very cool museum and fitting for Sin City. I highly recommend it. This is how I’ll leave Las Vegas with cash, and it’s how you can, too. Multiple countries use vending machines that offer free syringes and needles to drug users, but this resource will be the first in the United States to help curb the spread of disease in IV drug users. Many health agencies, including the World Health Organization (WHO) recommend offering clean needles to users (200 sterile needles and syringes per drug injector per year). Offering free needles has not been proven to incite or increase drug use, and “clean needles” will allow users, victim to their addictions, a safer way to inject without being exposed to HIV, hepatitis C and other blood borne pathogens. an information sheet about where one could go for addiction treatment. In order to use the machine, users must “register” without the requirement of giving personal information. Once registered a card with a code is given that allows access to the machine. The machines will be located at AFAN (Aid for AIDS of Nevada), the Community Counseling Center and Trac-B on West Charleston Blvd. The initial steps could deter some from coming forward to use the machines, but many who use IV drugs WANT to get help and prevent further medical complications. The outreach this provides, offering help to those who are addicted, is a huge step in our fight against heroin overdose and infectious disease spread. Daliah Wachs, MD, FAAFP is a Board Certified Family Physician. The Dr. Daliah Show , is nationally syndicated M-F from 11:00am-2:00pm and Saturday from Noon-1:00pm (Central) at GCN.